A magnitude 6.5 or higher earthquake on the Santa Susana Fault could damage dozens of active gas storage wells in the mountains above Porter Ranch, enough to cause a gas release, according to a long-awaited study, released on Tuesday. The amount of gas that might be released in such an earthquake is fairly small compared with the amount that's stored underground, said officials of Southern California Gas, which owns the field. However, it's enough of a threat that the utility may consider installing safety measures, such as installing automatic shutoff valves in the wells or injecting concrete between the wells and the soil around them. The study was conducted to assess the safety of the gas field after one of 114 then-active wells ruptured due to corrosion in 2015, producing the nation's largest-ever uncontrolled release of natural gas, about 109,000 metric tons to be exact. The leak took four months to halt, and about 8,000 families left the area, in part because of the rotten-egg smell. Some residents complained of illnesses like nosebleeds, stomach ailments and other symptoms they attributed to the gas. The Santa Susana Fault runs through the mountainous Aliso Canyon gas field the way frosting horizontally divides a layer cake. The gas wells punch through the surface, passing vertically through the fault, and extending 7,000 to 9,000 feet into the earth, where natural gas is stored in rock formations. The fear, as expressed in 2009 and again in 2017, in documents by a former manager of gas storage operations, as well as by Los Angeles County officials, was that a big earthquake on the Santa Susana Fault could shear the wells, allowing gas to reach the surface. The seismic study was designed to assess that risk. Independent experts designed and conducted the study on behalf of SoCal Gas. The draft of the study will be reviewed by the state Division of Oil, Gas and Geothermal Resources (also known as DOGGR) and three national laboratories, and the findings will be used to recommend tactics to reduce the risk of a gas release, said Neil Navin, SoCal Gas vice president for gas transmission and storage. Displacement along the Santa Susana Fault during a magnitude 6.5 or higher earthquake presents the largest risk to the 66 wells scattered across the 3,600-acre gas storage field, said Harvard professor John Shaw, who advised SoCal Gas on the study. The study indicated that no gas would leak from the wells in a smaller earthquake. To reduce the potential that gas might escape post-earthquake up the wellbore (the industry term for the hole in the earth that a well occupies), SoCal Gas will confer with its regulating agency, DOGGR, and the national labs about putting automatic shutoff valves in the wells fairly close to the surface, about 100 to 1,000 feet down. Another step might be to inject concrete into gaps between the outer metal surface of the well and the soil or rock surrounding it. 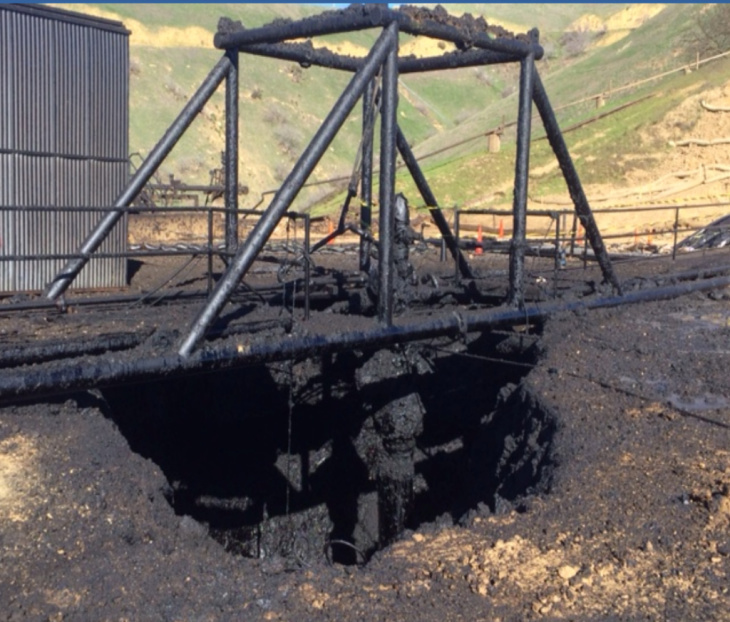 The analysis of shaking hazards from 150 faults, including the Santa Susana, did not reveal the potential for damage to wells resulting in a gas escape. "There are some extreme levels of ground shaking with that very rare, longer-term period events that could compromise the elements of some wells," Shaw said. "But this process has helped to identify which wells those are." Landslides could potentially cause two or three wells to leak gas to the surface, Shaw said. Those wells have been identified and steps are being taken to make them safer or shut them down.